You'll explore the less-touristy side of things at Kayaking & Canoeing and Dolphin Quay. Venture out of the city with trips to Rockingham Beach (in Rockingham), Fremantle Prison (in Fremantle) and Waterskiing & Jetskiing (in Mandurah). On the 3rd (Fri), spend an enriching day with Explore Tours Perth. There's much more to do: stroll around Kings Park & Botanic Garden, get great views at Mount Brown Lookout, explore the activities along Swan River, and take in the views from Elizabeth Quay. 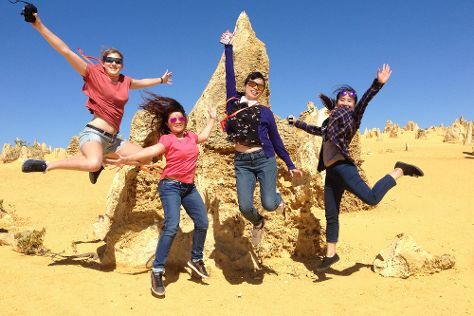 To find photos, where to stay, traveler tips, and more tourist information, use the Perth online trip itinerary builder . In May in Perth, expect temperatures between 25°C during the day and 11°C at night. Finish your sightseeing early on the 8th (Wed) to allow enough time to travel back home. On the 9th (Thu), explore the striking landscape at The Gap and Natural Bridge, take in the dramatic natural features at Elephant Rocks, and then enjoy the sand and surf at Greens Pool. Get ready for a full day of sightseeing on the 10th (Fri): get great views at Padre White Lookout, then steep yourself in history at Princess Royal Fortress, then examine the collection at National Anzac Centre, and finally see the interesting displays at Western Australian Museum - Albany. For maps, more things to do, reviews, and tourist information, use the Albany trip itinerary planner . Traveling by flight from Perth to Albany takes 3.5 hours. Alternatively, you can drive; or take a bus. While traveling from Perth, expect little chillier days and about the same nights in Albany, ranging from highs of 22°C to lows of 10°C. Wrap up your sightseeing by early afternoon on the 11th (Sat) to allow time for travel back home.